Preoccupied with career worries, Dr. Amsden Tilford goes for a hike and gets a lot more than she bargained for. First, a stinky encounter. Then an encounter bordering on the outright sensual, with the promise of something more when her path crosses with that of fellow historian McKee Cross. Meanwhile, the First Daughter can’t help but encounter her former secret lover on a near-daily basis. He’s assigned to shuttle the governor and herself around all the time. Yet one hot day it proves to be too much to bear. And with the weather about to turn to the colder days ahead, Coraleigh craves her mother’s legendary recipe. But a chance encounter at the grocery store reminds her food is not the only thing she desires. 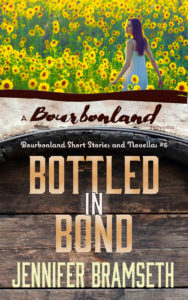 Bottled in Bond, a 45,000-word novella, is the fifth work in the Bourbonland Short Stories and Novellas Series. It takes place shortly before Executive Liaisons, Bourbonland Book 4.